Everyone throughout the land pitched their tents round about the temple, so that the door of the tent was facing the temple, so that they might hear the words of King Benjamin. 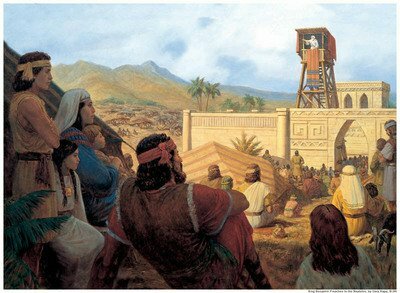 After the tower was erected, King Benjamin began to speak to the people, however because the multitude of the people was so great, not everyone could hear his words. So, King Benjamin ordered that his words being written down and spread to those who were not in the sound of his voice. King Benjamin begins by inviting those listening to his words to “…open your ears that ye may hear, and your hearts that ye may understand, and your minds that the mysteries of God may be unfolded to your view.” (Mosiah 2:9) How important is this? We should not lean solely on our own understanding, we should listen with our minds and our hearts so that we can hear the words and accept them into our hearts with a clear mind. Then, and only then can we hear the still small voice whisper the truths of what is being taught. When we do this, the mysteries of God will be revealed unto us. “…I am like as yourselves, subject to all chosen by this people… I have been suffered to spend my days in your service… and have not sought gold nor silver, nor any manner of riches of you; Neither have I suffered that ye should be confined in dungeons, nor that ye should make slaves of on another, nor that ye should murder, or plunder, or steal, or committ adultery… I myself have labored with mine own hands that I might serve you, and that ye should not be laden with taxes…” (Mosiah 2:11-14) we learn so many important things from this. First, King Benjamin explains multiple times that he is a servant of his people, not the other way around. He was appointed to serve, just like any leader. Leaders need to lead by setting examples, as he explained he labored with his own hands and set an example by not participating in wickedness. Second, King Benjamin explains that he os human, and thereore not perfect, or in anyway superior to his peopke. Thirds, King Benjamin explains that we should not be taxed, or become slaves to him or to any one else. Societies should work to help one another and reduce the amount of tax that everyone should pay. We as humans beings only have one true master, Jesus Christ. Our rulers, kings, presidents, etc of today work to serve and guide us to do good. Unfortunately we know this is not true in today’s world. But King Benjamin testifies that it is how it should be. King Benjamin explains that “…all that he [God] requires of you is to keep his commandments; and he promises you that if ye would keep his commandments that ye should prosper in the land; and he never doth vary from that which he hath said; therefore, if he do keep his commandments he with bless you and prosper you.” (Mosiah 2:22) How great is that promise? If we follow God’s commandments we will be blessed! How simple, yet amazing is this doctrine? “…beware lest there shall arise contentions among you, and he list to obey the evil spirit… For behold there is a wo pronounced upon him that listeth to obey him, and remaineth and dieth in his sins…” (Mosiah 2:32-33) We need to avoid contentions and strive to love one another and avoid sin. If we do stray away from God, we can always repent. However, King Benjamin warns us that “…if that man repententh not, and remaineth and dieth an enemy of God, the demands of divine justice do awaken his immortal soul to a lively sense of his own guilt, which with cause him to shrink from the presence of the Lord, and with fill his breast with guilt, and pain, and anguish, which is like an unquenchable fire, whose flame ascendeth up forever and ever.” (Mosiah 2:38) Sin is so dangerous, because if we wait to repent it may be too late. It is interesting that King Benjamin explains the punishment, which one could attribute to a “hell” like torment as simply guilt. Is there a physical hell with fire and brimstone? The scriptures refer to one in many occasions throughout the Book of Mormon and the Bible, however, I personally believe that it is in reality more like King Benjamin describes, as a person torment that feels our bodies with guilt, like a fire. Have you ever done something wrong, and felt bad about it? I sure have, and it does feel like a fire burning on the insight, and the guilt tears you apart. Would you want that feeling forever? I sure wouldn’t. On a positive note, King Benjamin asks his people to think about the “…blessed and happy state of those thst keep the commandments of God. For behold, they are blessed in all things, both temporal and spiritual; and if they hold out faithful to the end they are received into heaven, thereby they may dwell with God in a state of never-ending happiness. O remember, remember that these things are true: for the Lord God hath spoken it.” (Mosiah 2:41) Remember, wickedness never was happiness. Having a clean conscience helps anyone to sleep well at night. We should all strive to live a life free from guilt, and torment. This life is meant to be lived and the best way to do that is to follow God’s commandments. “And now there was no more contention in all the land of Zarahemla…” (Mosiah 1:1), King Benjamin was the ruler during this time and he had three sons; “…Mosiah, and Helorum, and Helaman. And he caused that they should be taught in all the language of his fathers, that thereby they might become men of understanding…” (Mosiah 1:2) This would give King Benjamin’s sons the ability to know of the prophecies of the prophets that had come before them. Because Lehi had preserved the records and the language (Egyptian), they now benefit of these things and understand the mysteries of God. We too in our modern age benefit from the preservation of these records from Lehi, to King Benjamin, to his sons, etc. King Benjamin speaks to his sons, but also to us the reader, when he testifies that the words that have been written as part of the plates he know holds are true. Not only that, but King Benjamin testifies that if we “…search them [the scriptures] diligently… ye may profit…” (Mosiah 1:7) We must not only read, but study the scriptures. If we do this and follow God’s commandments we will prosper! King Benjamin sees that his days are numbered and that he soon will pass on. He decides to choose one of his sons to become King. He chooses Mosiah and confers the power of the kingdom to him. He commands Mosiah to make a proclamation through the land that he is “…king and a ruler over this people…” (Mosiah 1:10) He also explains to his sons that because the records have been preserved throughout time, God has had mercy on them. 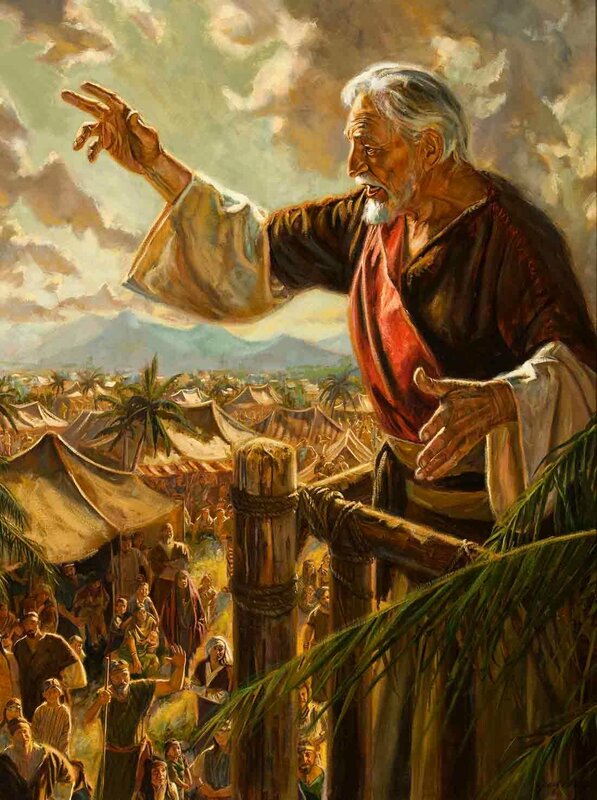 The chapter ends with Mosiah commanding the people to come to the temple to hear the words of his father, King Benjamin.